Many people own dogs, at least to some degree, for their protective nature, but it’s important to understand the difference between natural protective/ territorial behaviors and aggression. Protective dogs are on the alert and do not normally show aggression to their owners and will back down if the person is invited in by the owner. True aggressive dogs will display aggression when challenged by anyone — strangers and owners alike. 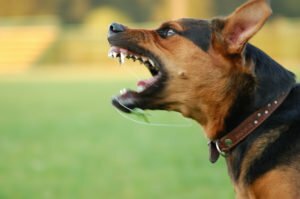 Owning an aggressive dog is not only dangerous for you and your family and friends, it is also a legal liability that could cost you in local government fees for owning such a dog, higher insurance rates — or rejected coverage — and even heavy financial losses due to being sued if your dog bites or attacks someone. While you can’t change the temperament or genetic makeup of a dog, you do have control of the dog’s environment and training, which can go a long way toward reducing any innate aggression the dog might have. It’s important to note that correct training and properly establishing a leadership role with your dog can make a naturally aggressive dog less so, but doing things incorrectly can make a dog that doesn’t have these tendencies more aggressive. In this article, we’ll focus on the training techniques that promote aggression that you don’t want to use and the ones that have the opposite effect. The clear message here is that gentle but firm treatment of a dog has the greatest success when it comes to dampening aggression in all dogs, no matter their temperament. Whether your dog is aggressive or you simply want your dog to be a better companion, Tropical Dog Training can help. Call us today with any questions you may have about our programs that help dog owners have a well trained companion animal they can be proud of.